Is it just me or are we seeing a lot of downtrend reversal formations on the comdoll crosses these days? It might be a bit too early to call it, but it looks like we’re in for long-term trend changes now that risk appetite is returning. Anyway, I’ve thought of going long on a break past the 84.00 neckline a few days back but I decided to wait for a bit more confirmation first. Now that the pair completed a short-term pullback to this broken resistance and has climbed past last week’s high, it seems safe to say that bullish pressure is indeed kicking in. With this setup, I can set my stop below the dip to 84.00 and aim for at least 250 pips or the same height as the chart pattern. Zooming out to the daily time frame reveals that the next area of interest is located around the 87.00 mark so I’m putting my PT just slightly below that level. I’m even seeing a potential inverse head and shoulders pattern on this time frame, with the pair just working up to form its right shoulder. If this formation is completed and fundamentals remain more or less the same, I’ll consider adjusting my target higher and adding to my position on a break of 87.00. 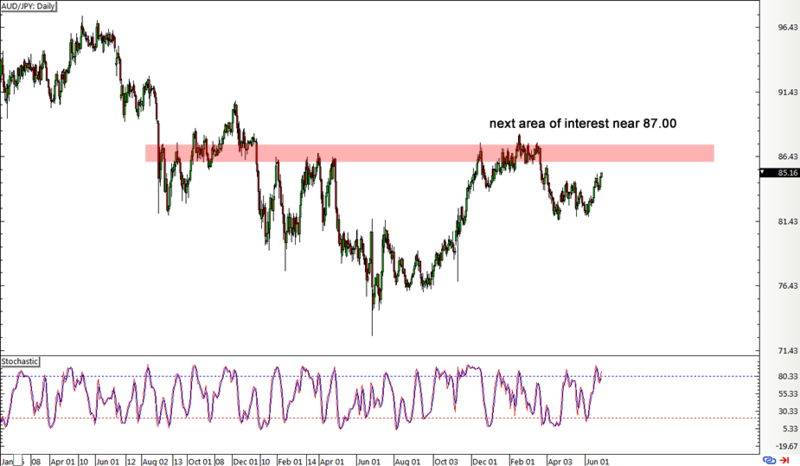 The pickup in risk-taking is keeping me bullish on the Aussie these days and bearish on the lower-yielding yen. To top it off, renewed expectations for another Fed rate hike before the end of the year has kept U.S. bond yields supported, forcing the Japanese currency to give way to the dollar. Looking ahead, we’ve still got a few reports from Japan towards the end of this week so I’m hoping to see more action on this yen pair. In Australia, traders seem to have shrugged off Moody’s downgrade on banks due to housing sector risks, signaling that the RBA’s relatively optimistic stance carries more weight. 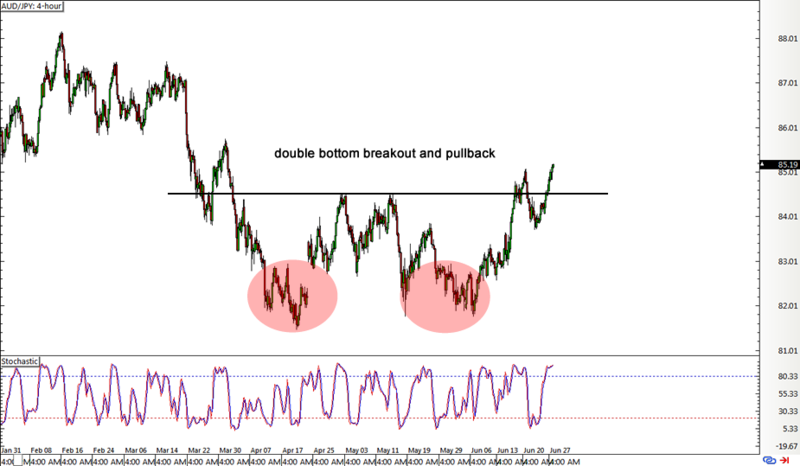 Long AUD/JPY at 85.15, stop loss at 83.75, initial profit target at 86.75. I’ve risked 0.5% of my account on this trade for a potential 1.14-to-1 R:R.
Given how market sentiment has been a bit more jumpy than usual these days, I’ll also be on the lookout for any early exit signals. In particular, I’ll pay close attention to BOJ Governor Kuroda’s upcoming speech to see if it will be yen bullish, although I doubt that the central bank head would want to spur currency appreciation.